When Neil Armstrong and Buzz Aldrin stepped onto the Moon all those years ago during the Apollo 11 mission, literally everything they did became a record because everything they did that day was the first time in human history someone had done that thing on the Moon, which it turns out wasn’t made of cheese after all. While Armstrong’s first words on the Moon are some of the most famous (and controversial in terms of what he actually said exactly) ever uttered, a lot of the more mundane things astronauts did first on the Moon aren’t as well known. For example, after Aldrin joined Armstrong on the surface of the Moon, one of the first things the pair did was hop around like kangaroos… for science! You see, NASA wasn’t entirely sure about how astronauts would be able to move around on the Moon since they could only theorise about how the lower gravity would affect their movement and balance. As such, the pair were asked to experiment with different ways of moving to discern the most efficient method of getting from point A to point B for future astronauts. Initially, NASA had assumed that the best way to move around on the Moon would be to use small, double-footed jumps not unlike a kangaroo. 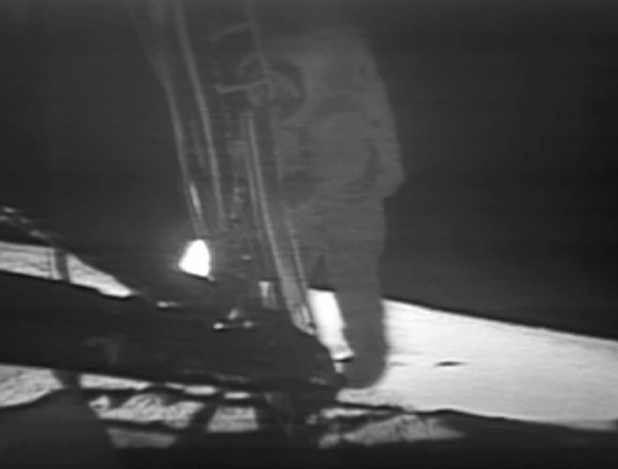 However, Aldrin and Armstrong found this way of moving “awkward and unnatural” and both astronauts found it much easier to move in a more conventional manner, hopping from one foot to the other. Armstrong nicknamed this way of moving “the lope” and you can see a video of Aldrin demonstrating and comparing the technique to the kangaroo hop, here. The first known person to fall over on the Moon was Astronaut Alan Bean, the fourth person to set foot on its surface. Bean fell over several times from tripping over rocks. According to Bean, falling over wasn’t “a big deal at all” thanks to the lack of gravity which also made standing back up a simple, if ungraceful, task. Bean would later immortalise his historic tumble on the Moon in a painting depicting him being helped up by fellow astronaut Pete Conrad. The painting is aptly titled “He Ain’t Heavy, He’s My Brother“. Almost no footage survived the Apollo 12 mission because they pointed the camera they took with them at the Sun. However, if you really want to see astronauts falling over and awkwardly trying to get back up again, there’s footage of that from the Apollo 16 and 17 missions respectively. As you’re probably aware, the first sport ever played on the Moon was golf, when during the Apollo 14 mission, astronaut Alan Shepard attached a 6 Iron to an excavation tool and hit two golf balls, one-handed while his crew (and the world) watched. Shepard famously exclaimed that his second shot went for “miles and miles and miles” in an excited tone after being criticised for his poor form and technique by Mission Control. They told him to bend his knees and keep his head down, to which Shepard hilariously replied “I’m, erm, wearing a space suit”. While it’s clear that Shepard was exaggerating that his shot went for miles, physicists have concluded that it’s entirely possible that his slightly pathetic, one-handed shot could very well be the longest drive in history, realistically traveling over 400 yards. This would make it the first sporting world record broken on the Moon. As for the first full meal on the Moon, as outlined by the Smithsonian, this consisted of bacon, cookies and coffee, along with some peaches and a glass of grapefruit juice. If you hoped the bacon part of the meal was the first item eaten on the Moon, we’re sorry to disappoint. Contrary to what you’ll often read, in fact, a very small something was eaten shortly before the meal- communion bread, eaten by Buzz Aldrin shortly after landing on the surface. Before Aldrin set off on the Apollo 11 mission, he took with him a small communion kit given to him by Rev Dean Woodruff, so that he could symbolically take part in the ceremony with the other members of his Presbyterian church. This kit contained a small piece of communion bread and a small vial of wine, both of which Aldrin consumed after saying a prayer during the Apollo 11 radio blackout. This was also, unsurprisingly, the first religious service held on the Moon. Aldrin had initially planned to share his Communion prayer with the people of Earth, but NASA requested at the last minute that he not do this in order to avoid offending people not of the Christian faith, as had happened when the crew of Apollo 8 had read a passage from Genesis. Aldrin agreed and instead performed the ceremony privately while Armstrong “respectfully observed”. Aldrin also took another interesting first from Armstrong- Buzz managed to become the first person to urinate on the Moon. Take THAT Mr. “Gets to walk and talk on the Moon first-Armstrong”. Buzz Aldrin’s mother’s name, before getting married, was Marion Moon. Armstrong and Aldrin also left a number of souvenirs on the Moon, including a medal dedicated to Yuri Gagarin and a personal message from President Kennedy. They also carried a piece of the Wright Brothers’ plane with them too. Why do the astronauts alternate between bounding and walking? Could you really hit a golf ball miles and miles on the Moon?